The Galápagos archipelago is a chain of 19 Islands and dozens of islets formed through volcanic eruptions between 3 and 5 million years ago. They are located about 600 miles off the coast of Ecuador and are an important tourist attraction including by Charles Darwin who spent 19 days at the islands studying flora and fauna for his theory of evolution paper. They went on to become popular after his visit and were even named a UNESCO World Heritage Site in 1978. The attraction in these human inhibited islands includes animals and vegetation in addition to the landscapes and other scenery. 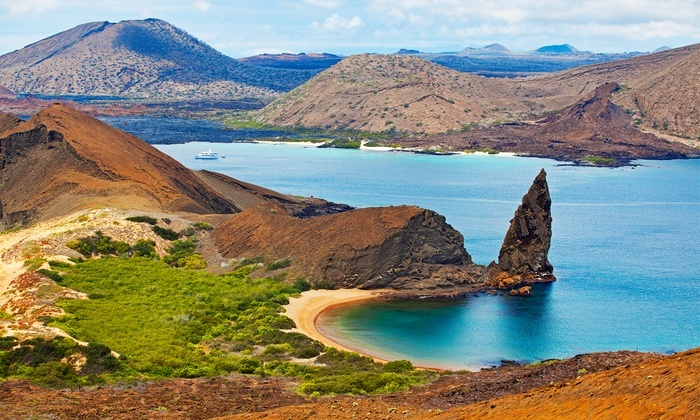 Being inhibited islands, you can choose to stay at a hotel or on a live-aboard boat during your Galapagos Island tour. However, most of the islands are uninhibited but there are day boats plying to them out of harbors. Cost: Although it is expensive to visit and stay at the Island, you can create a less expensive experience by choosing to be land-based instead of the live-aboard boats. For instance, hotels and restaurants located on San Cristóbal Island, Santa Cruz Island, and (to a much lesser extent), Isabela and Floreana islands are less pricy that these boats. Price of accommodation in these hotels is also widely variable. Time management: The disadvantage of choosing a land-based vacation is that you will spend a lot of time accessing the islands compared to anyone choosing the live-aboard boats. For instance, you would have to spend a good amount of time moving from hotel, to the boat and back to the hotel again. The boats move from place to place and passengers sleep in cabins on the boat, so you won’t spend any time trying to get from land to attractions you want. It is recommended to choose a hotel located near the harbor so you will be close to where you will board the boat for the day trips. You can also enjoy scenery and sea creatures such as sea lions on a small beach if you choose some hotels at the island. You can also choose to book and stay in rooms or corner suites that have living-room bathtub with views and glass walls that will slide open to provide great views outside. Some hotels even have beached boats that do itineraries to land sea adventures exclusively for guests. That means you won’t have to spend any time looking for a boat. Access: A land-based Galapagos Island tour is also limited to the five islands that are reachable in a single day. These islands can be, however, enjoyed via boats. 4 Underwater adventures: If you are a scuba diver, you can select The Galapagos Sky, Galapagos Aggressor III, Humboldt Explorer, Galapagos Master, and Nortada live-aboard boats that are specifically designed for scuba divers. They also reach the little-visited northernmost island of the Galápagos archipelago where you can do deep, cold current-filled diving. The location also has manta rays, whale sharks, sunfish, and hammerhead sharks. The trip is recommended for experienced divers only. Where to go: Galapagos Island tours are recommended at any time of the year although January through May are warmer and wetter months, March and April tends to be the hottest and wettest months, August tends to be the coolest and June through December are the cooler and dryer months of the year.